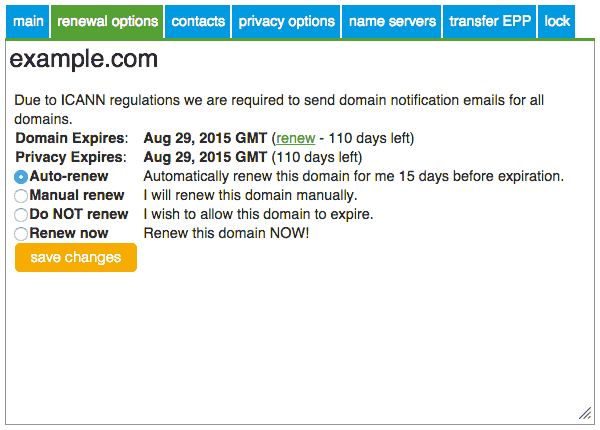 All domains kept on the default auto-renew setting will attempt renewal 15 days prior to expiration. Regardless of the renewal setting, you can manually renew your domain at any time through the Domain Manager in your FastDomain Control Panel. Log into your FastDomain account. Select the domains tab from the top of the account. On the left side is a list of the domains in the account. Check the box for the domain you wish to renew. Some options will appear to the right of the domain list. Select the Renew Now option and then click Save Changes to be taken to your Shopping Cart. Review the items in your Shopping Cart and remove any items you do not want to renew or purchase by clicking the grey X to the right of the Subtotal. Note: Domain Privacy will automatically be added to the cart if it is enabled for the domain. To process the payment, enter the CVV2 code if you are using the credit card on file for your purchase. If you wish to use another payment method, please select the Change Payment Method link and follow the directions on-screen. Click Process Order at the bottom of the screen to complete your purchase. A cart-receipt email will be sent to the email address on file for the account once the payment has processed successfully, and a complete receipt will be in the Billing History. Click HERE for steps to view your receipts. Manually renewed domain registrations cannot be canceled for any reason. Since manually renewing a domain requires someone to log into the account and process the payment, all manual renewals are assumed to be intentional and the funds are immediately sent to the registrar to permanently extend the expiration date. In contrast, domain registrations that are automatically renewed by BRAND can be reversed prior to the start of the new term because the funds are not sent to the registrar until the previous term expires.